Part of the master plan when we bought Fishponds Cottage was to try and achieve some level of self sufficiency. I realise that this may result in us all becoming vegan if we see it through completely, as I don’t think I’d be any good at milking cows, killing pigs or making cheese. But we’re making a start. Back in November, I had some very nice men come and fence off an area of one of the fields as a designated vegetable patch. We have hundreds of bunnies in that particular field and have spotted deer on a few occasions, so it’s pretty much the Fort Knox of veggie patches. The rabbit fencing has been buried deep and the deer fencing is about 6 foot high. Only time will tell if this is enough to keep those determined little rabbits out! 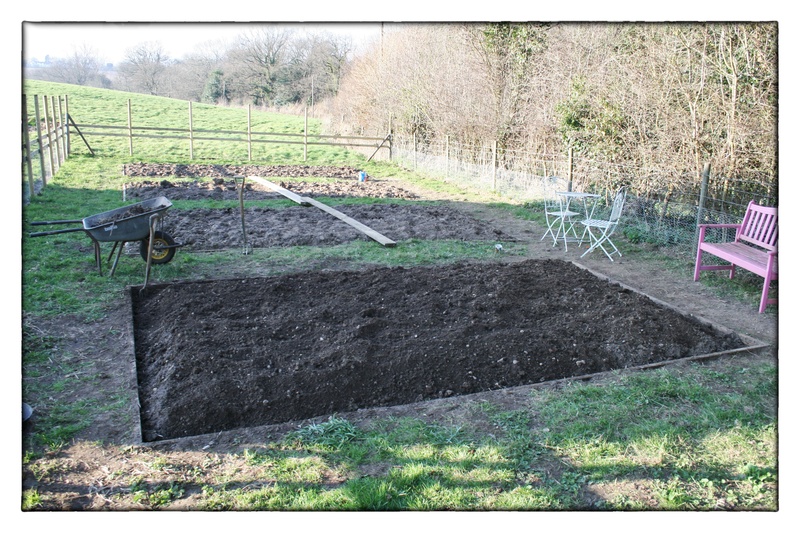 They marked out four good sized plots, roughly turned it over and dug in some manure from the old muck heap. From a distance it looked ready to go. 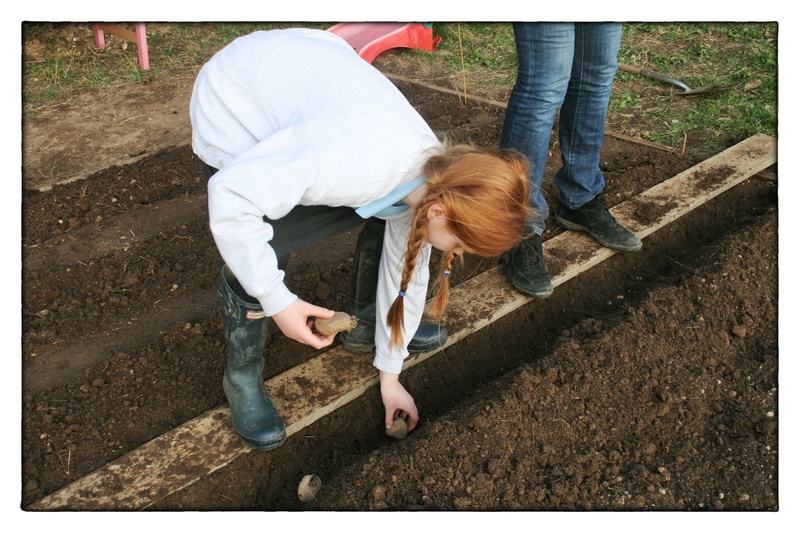 But on closer inspection it became obvious that a lot more elbow grease was needed before we could get down to the exciting business of planting. So with the sun shining last weekend, we set about digging. If I’m honest, Stu did most of the backbreaking work. Once he’d turned it over and pulled out all the big roots, I went through it again, picking out all the nettle roots and weeds. 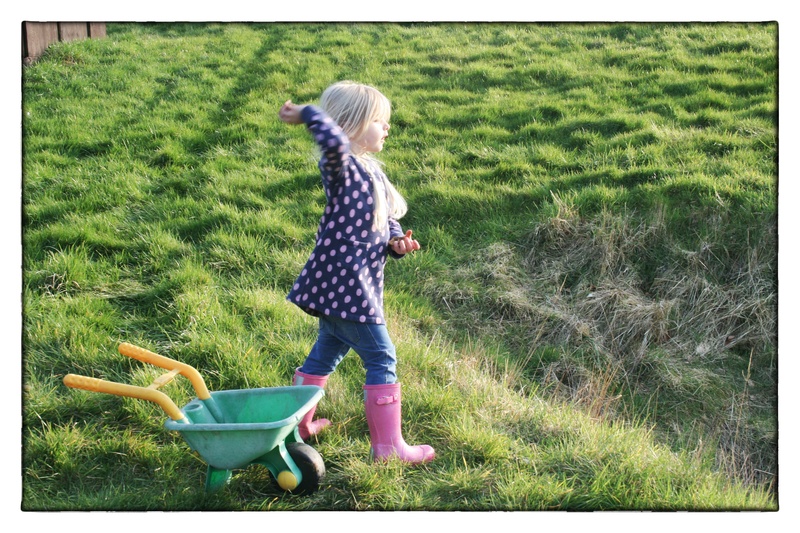 Maddie and Saffron collected all the stones in their wheelbarrow and then threw them into the “pond”. The pond is actually a ditch used by the previous owner to practise riding her horses through water. Sadly it doesn’t appear to harbour any interesting wildlife ; there are have been no signs of frogs, and no frog spawn. There haven’t been any newts, or even any pond skaters. It really is just a muddy ditch filled with stagnant water and so the long term plan is to fill it in. 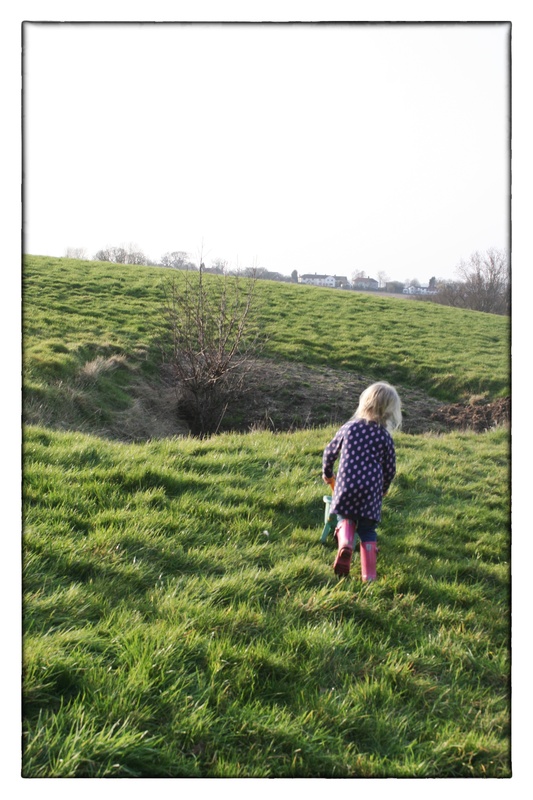 In the meantime, throwing stones in there has provided hours of fun for the girls. It was about 5pm on Sunday by the time we’d finally finished. 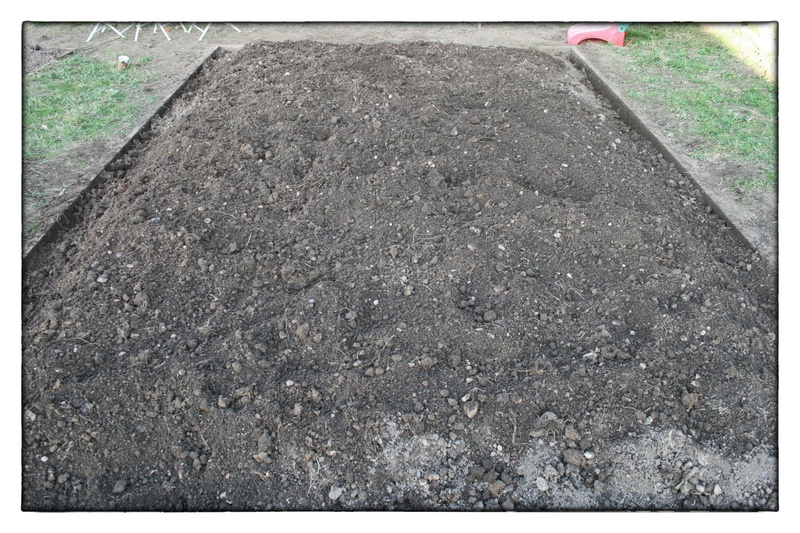 I carefully raked the newly dug and weeded soil level. 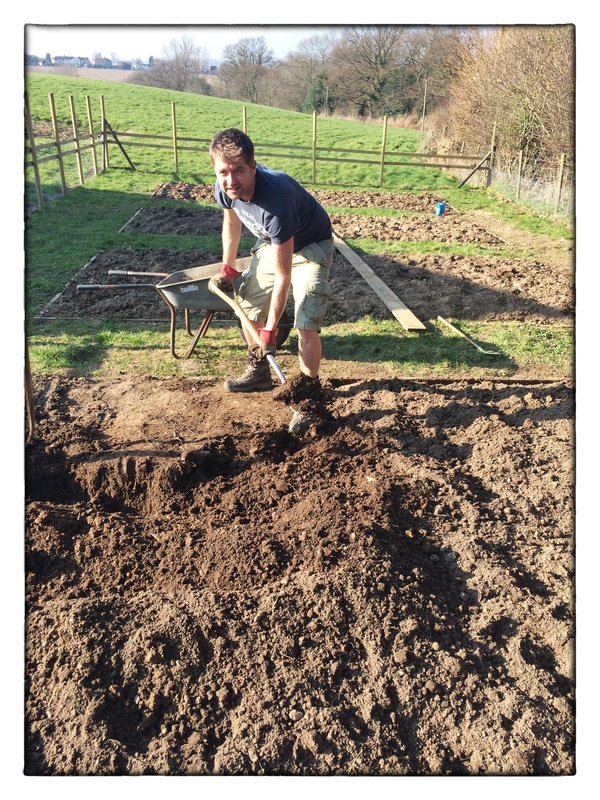 And I have to say, despite the aches and pains from all that digging, it felt good. Now, I’m no expert in the garden – we’ve inherited a gardener here, so I haven’t needed to tend to the garden, although I will pull out the odd weed every now and again. I have phases of real enthusiasm but this always seems to dwindle, and packs of seeds remain in their packets, and bedding plants start to wilt in their pots. But I’m determined to make a go of this veggie patch. I’ve read a book and flicked through a couple of gardening magazines. But to make sure I’m doing it right, I’ve enlisted the help of Granny. Granny has a proven track record in the vegetable growing field, even if she her crops always tend to be a bit courgette heavy. 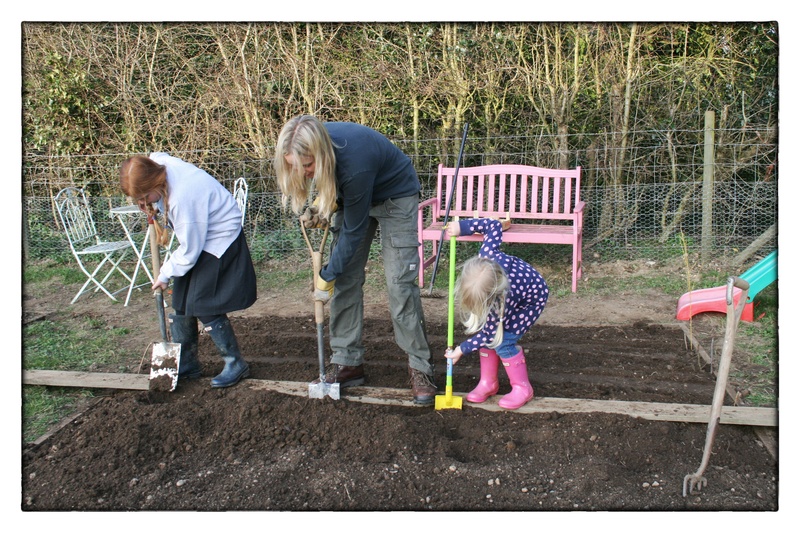 A few weeks ago we paid a trip to a garden centre and mum told me all about seed potatoes. I bought some in anticipation of having somewhere to plant them. My choice of variety was made in a similar way I choose a horse for the Grand National – solely on their name. So when I spotted a potato called Osprey, I knew it was the spud for us! 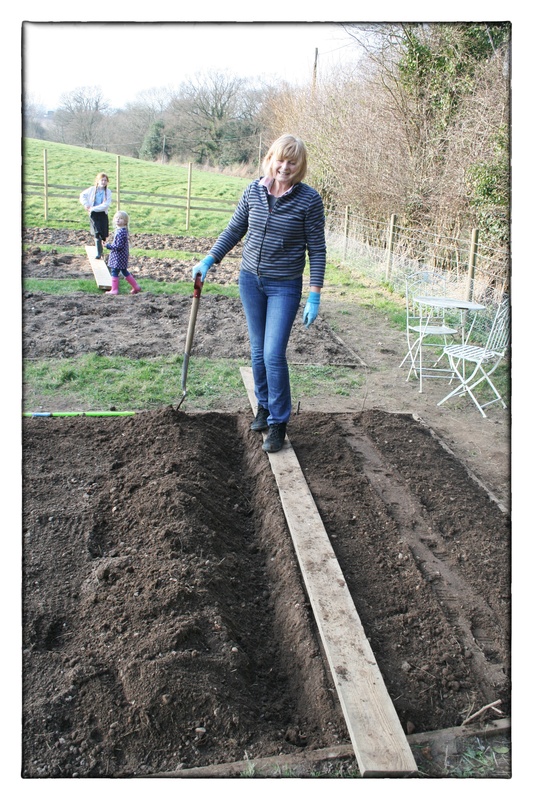 Mum showed me how to chit the seed potatoes a month or so ago– basically to stand them on their end to encourage shoots at the top. And as luck would have it, they were ready to plant this week. 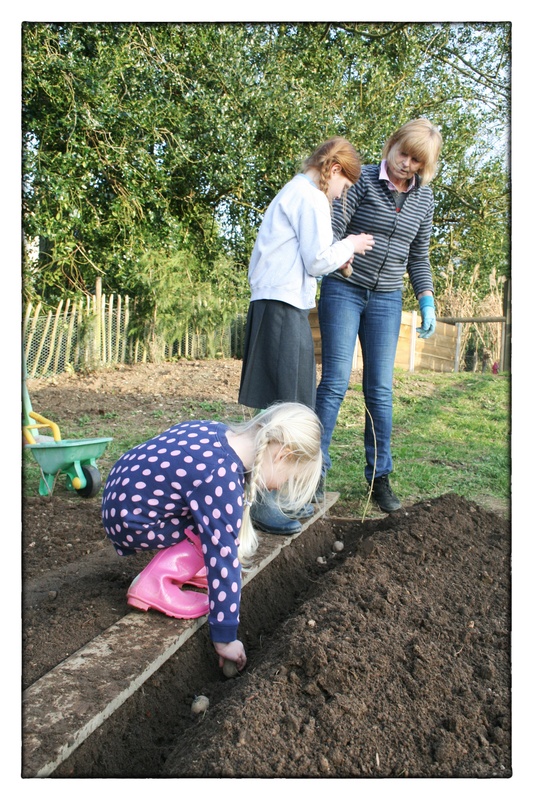 So with Maddie and Saffie in tow, we learnt how to dig a trench and carefully plant the potatoes with their shoots at the top. Maddie and Saffie were great. They listened, and followed the instructions and seemed as pleased with our efforts as I am. So, the first crop is in. Now to dig the other three beds and decide what other lovely vegetables we fancy eating later in the year.